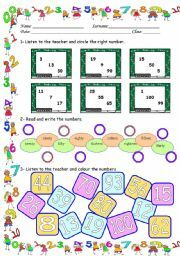 3 listening activities with numbers from 1 to 100. 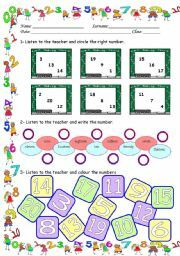 3 listening activities with numbersfrom 1 to 20. Sts listen to the teacher calling out the numbers. They have to circle, write and colour. 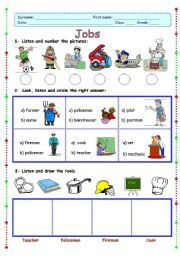 it has 3 listening activities: 1st listening and write; 2nd listen and circle; 3rd listen and draw. 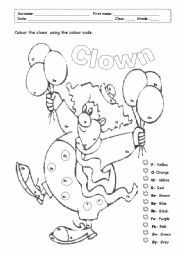 2nd and 3rd exercises could be "read and circle/draw" if your students can read. 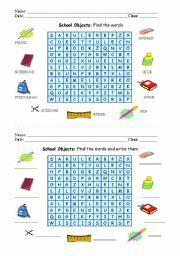 It�s a wordsearch (2 options). The 1st has the words and sts have to find them. 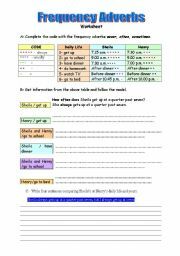 The 2nd has just the pictures and sts have to find the words and write them. 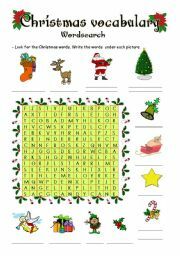 wordsearch Look for the word and write it under each picture. Mickey needs help! He wants to decorate his christmas tree. Can you help him? Have fun!! STUDENTS HAVE TO CHOOSE THE RIGHT WORDS ACCORDING TO THE PICTURES. REVIEW FOOD and DRINKS VOCABULARY.